With the elaboration of the general plan for Operation Overlord, its precise outlines were to be decided at the Trident Conference in Washington in May 1943. It appeared that the flanks of the invasion area were particularly important as their control was a preponderant element in the evolution of the fighting. Thus, three airborne divisions were designated by the Allied High Command to secure these areas: the 6th British Airborne Division to the east of the Orne river had to secure the left flank while the 82nd and 101st American airborne divisions were to be dropped over the right flank in the Cotentin Peninsula. The 82nd (commanded by General Ridgway) and the 101st (commanded by General Taylor) were formed as airborne divisions in 1942. The 101st did not, prior to Operation Overlord, have operational experience unlike the 82nd which was already deployed on July 9, 1943 in Sicily: the training in the United States and then in England succeeded so that nothing was left to chance. For the American airborne units, three major objectives were defined by the Allied High Command: to seize the routes linking the beach to the inland, to hold the road junctions as well as the tactical relevant localities and finally to control the only two bridges on the Merderet river. These missions are explained below. 1. Seize the causeways connecting the beach to the inland. The terrain in the Contentin Peninsula was transformed by the occupant in an unfavorable area to the installation of a bridgehead. Indeed, the Germans flooded a large part of the land from the south of Valognes to the localities of Carentan and Isigny-sur-Mer. Utah Beach sector, chosen for the landing of American soldiers belonging to the 4th Infantry Division, was thus isolated by a rampart of marshes and was accessible only by four narrow roads. The main mission of American parachutists was to seize these four access roads called “causeways” in the early hours of June 6, 1944, in order to allow the landing troops to advance as fast as possible towards the west and to widen the bridgehead. 2. To seize key points, road nodes and tactical relevant locations of the area. The area of operation is crossed from north to south by the national road 13 (RN 13) which connects Caen to Cherbourg: it is a major traffic route in the region and which crosses the boroughs of Saint-Côme-du-Mont and Sainte-Mère-Eglise. Other towns are located along the roadways and their control depends on the free circulation of the allied forces in the region: paratroopers are given the task of seizing them and controlling the various crossroads. In addition, a German artillery battery is positioned at Saint-Martin-de-Varreville and had to be destroyed before sunrise. 3. To control the bridges over the Merderet and the Douve rivers. Inland Utah Beach is closed to the west by the Merderet River and to the south by the River Douve, to which must be added an imposing marsh, one to three kilometers wide depending on the location. Two bridges cross the Merderet, located at La Fière and Chef-du-Pont, while four bridges cross the Douve and the Carentan Canal to the north of Carentan. These structures became priority targets for paratroopers, as they represent a gateway to the beachhead of Utah Beach in the Cotentin. While the bridges on the Merderet are to be preserved, the Allies decide to destroy those on the Douve. The Allies are aware that the greatest weakness of the airborne units lies in their lack of firepower. Equipped with small arms, they are not theoretically capable of fighting against an opponent with heavy armored vehicles. Thus, airborne units are to receive the support of gliders troops: the latter are armed with anti-tank guns, Jeep light vehicles and heavy machine guns, equipment for sappers. The 82nd Airborne Division transport and drop-off missions are coded “Boston“. For the 101st Airborne Division, this is operation “Albany”. 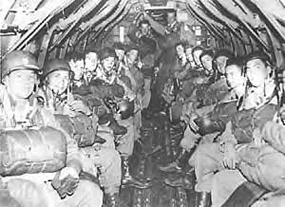 The gliders are to intervene at four o’clock in the morning according to operations Chicago (101st Airborne) and Detroit (82nd Airborne). Early evening, on D-Day, additional reinforcements are to be transported by gliders: these are Elmira (101st Airborne) and Keokuk (82nd Airborne) operations. In order to carry out these various missions, Americans forces defined six drop zones (DZ) for each one of the six paratrooper infantry regiments forming the two divisions Airborne. Two landing zones (LZ) were also chosen for the landing of the gliders. The total DZ and LZ represented an area of ​​39 square kilometers. These areas are distributed as follows. The paras of the 82nd Airborne Division land on three DZs located west of the RN 13: DZ “O” is dedicated for the 505th Parachute Infantry Regiment in order to seize Sainte-Mère-Eglise. DZ “T” is for the 507th Parachute Infantry Regiment and is located north of Amfreville in order to hold the northwest approaches of the bridge of La Fière. DZ “N” is for the 508th Parachute Infantry Regiment and is located north of Picauville in order to control the south-west approaches to the La Fière bridge and to seize Pont-l’Abbé. The 101st Airborne Division drop zones are located east of the RN 13: DZ “A” is located north of Turqueville and Audouville-la-Hubert and is dedicated for the 502nd Parachute Infantry Regiment in order to seize causeways 3 and 4. DZ “C” is for the 1st and 2nd battalions of the 506th Parachute Infantry Regiment and the 3rd battalion of the 501st Parachute Infantry Regiment. It is located north of Hiesville and aims at seizing causeways 1 and 2. DZ “D” is located south of Vierville and is dedicated for the 1st and 2nd battalions of the Parachute Infantry Regiment and the 3rd battalion of the 506th Parachute Infantry Regiment, in charge of seizing Saint-Côme-du-Mont and bridges over the Douve river. Gliders have to land at LZ “E”, west of Hiesville, and LZ “W”, south of Sainte-Mère-Eglise at Les Forges. These two zones are deliberately located at the geographical center of the area of operation and in the immediate vicinity of RN 13. Each of the Parachute Infantry Regiments (PIR) is carried on board three to four formations called serials. These serials are composed of 36, 45 or 54 C-47 and are spaced apart by six minutes on the drop zone. 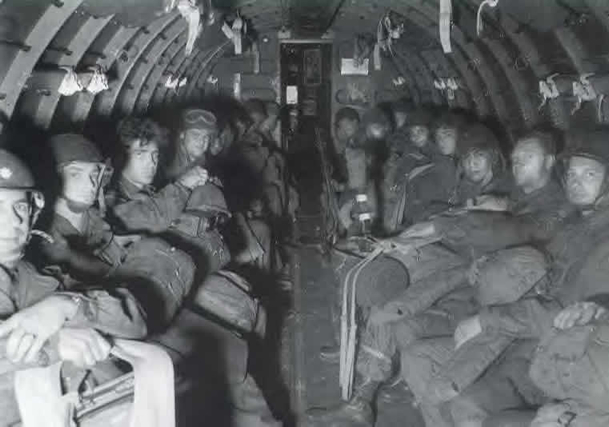 On board the Dakota, paratroopers form a “stick” of 15 to 18 men according to their equipment. Two German divisions are located in the American area of ​​operations: General Karl-Wilhelm von Schlieben’s 709th Infantry Division along the Cotentin coastal front and the 91st Infantry Division as a reserve force in the center of the Contentin peninsula. American targets concentrate more particularly on the positions of three opposing regiments. On the one hand, Grenadier Regiment 919 (commanded by Lieutenant-Colonel Günther Keil) of the 709. Infanterie-Division, located to the east of the RN 13 and installed on several strong points along the coast and in various villages in the area. On the other hand the Grenadier Regiment 1057 and Grenadier Regiment 1058 of the 91. Luftlande Infanterie-Division (commanded by General Wilhelm Falley), positioned west of the Merderet river. On the eve of D-Day, German defensive positions lacked cohesion in this region, notably because enlargement work of the positions had not been completed. Germans do not represent the sole concern of the Allies airborn troops: the US General Staff questionned the chances of success of this airborne operation. Indeed, DZ were bordered by numerous marshes and the slightest error of parachuting could lead to heavy losses. Trafford Leigh-Mallory, Commander-in-Chief of the Allied Air Force during Operation Overlord, said that the most pessimistic forecasts of casualties were 50 per cent for paratroopers and up to 70 per cent for glider troops. 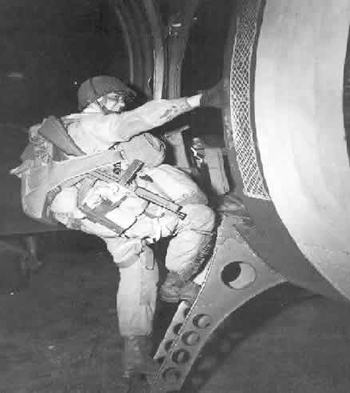 With their TS-type parachute and nearly 40 kilos of equipment, 13,000 American paratroopers of the 82nd and 101st Airborne divisions board shortly before midnight on June 5, 1944, aboard 1,087 Douglas C-47 aircraft. The first paratroopers to take off were the Pathfinders, which were responsible for marking the drop zones and directing the planes using the “Eureka” tags (which send pulses picked up by the “Rebecca” transceivers, installed under the Dakota fuselage). These were the first Americans of Operation Overlord to jump in Normandy. DZ “O” markup was the only one to be fully in place: for other Pathfinders, the lack of technical means or the presence of enemies on the DZ prevented the realization of the mission. The aircraft then headed for Brittany at low altitude (150 meters) to avoid German radar echoes and was flying over the sea a few kilometers north of the Guernsey and Jersey islands. At the same time, English Stirling bombers dropped thousands of aluminum foil slats, nicknamed Windows, in the area of ​​Granville (south of the Cotentin Peninsula), returning radar echoes identical to those of the planes. Germans thought they were seeing thousands of aircraft over the Cotentin on their control screens, while the actual number of aircraft did not exceed 1,500. During the flight over the Cotentin (on a southwest-northeast axis), Douglas C-47s were greeted by heavy fire from the German FLAK (anti-aircraft defense), which sowed disorder among the squadrons of the US Air Force. Operation Albany (101st Airborne Division) began at 00:20 with the Pathfinders drop. Next elements of the Parachute Infantry Regiment were dropped twenty minutes later. 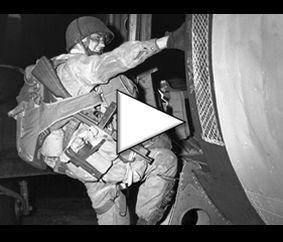 Operation Boston (82nd Airborne Division) started at 01:21 with its own Pathfinders drop. 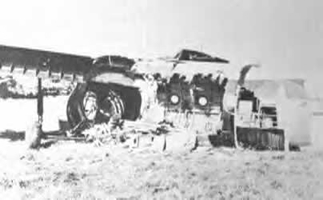 Several dozens of aircraft were hit and exploded in flight. Others crashed on the ground, most often before the paratroopers had time to get out. Pilots broke the serials and decided to turn the green light on even before the DZs were reached. Thus, many paratroopers found themselves dropped to several tens of kilometers from their initial objectives. Others, less fortunate still, felt into the marshes and drowned there. 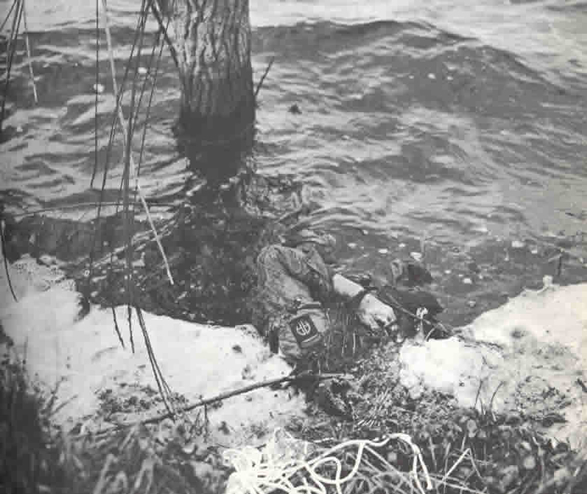 Some paratroopers drowned by less than a meter of water, being extremely loaded. John Taylor, a paratrooper belonging to the 101st Airborne Division, remembered: “Those who jumped from the C-47 before me drowned in a marsh, just like those who jumped after me. I landed on a thin strip of land a few meters wide that crossed the marshes “. 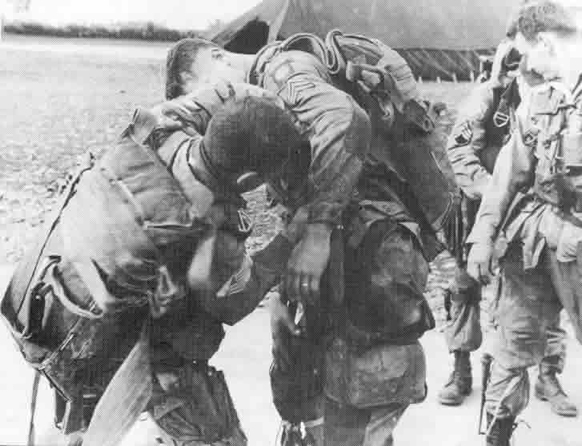 More than 75% of the paratroopers were not dropped over the initially planned DZ and this terrible fact caused a total disorganization of the American airborne forces. Men gathered depending on the random drops and tried heroically to fulfill their mission. Some sticks have been dropped at sea, others between Pointe du Hoc and Omaha Beach, more than 40 kilometers from their DZ. Paratroopers from both airborne divisions were mixed on the ground and the command of these teams became a matter of rank and charisma. This general disorder led to a series of unforeseen clashes throughout the south-east of Cotentin: the Germans, impressed by the number of skirmishes in progress, limited their interventions and were disorganized as well, their units being hooked in various places by a a force whose firepower and strength was still unknown. 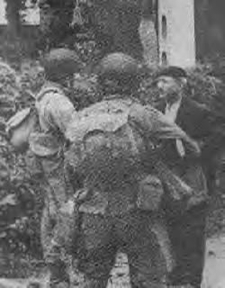 Small groups of paratroopers were organizing and heading towards their objectives, gathering on their way isolated American soldiers who had lost all contact with their own unit. 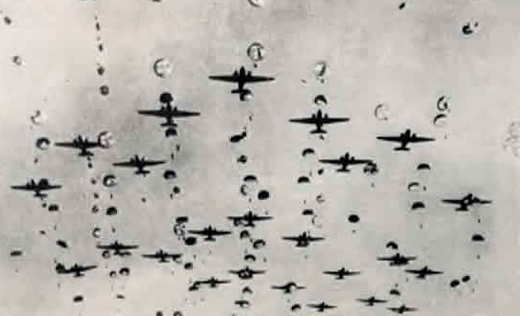 The 101st Airborne was dropped on a total surface of nearly 40 kilometers by 15 kilometers. Many Waco gliders, carrying men and equipment, also landed in the southeast of the Cotentin Peninsula, but visibility and weather conditions considerably hampered operations: many gliders crashed against hedges or Norman houses. Losses were catastrophic. The very strong dew that night significantly hampered the work of the pilots who did everything they could to stabilize the speed of their glider during the landing phaze. General Pratt, deputy commander of the 101st Airborn Division, was killed when his glider crashed in a hedgerow southwest of Hiesville. 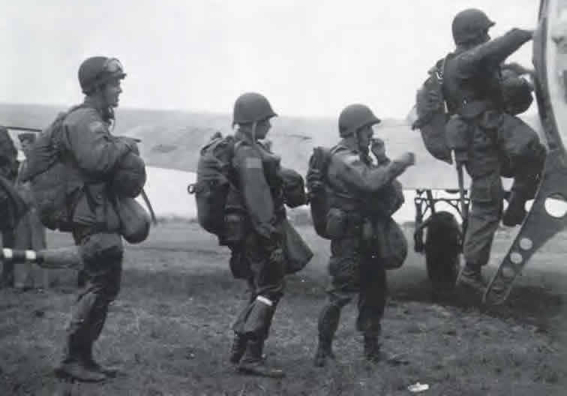 American paratroopers were scattered throughout the southeast of the Cotentin Peninsula, and only a few platoons reached their drop zones. 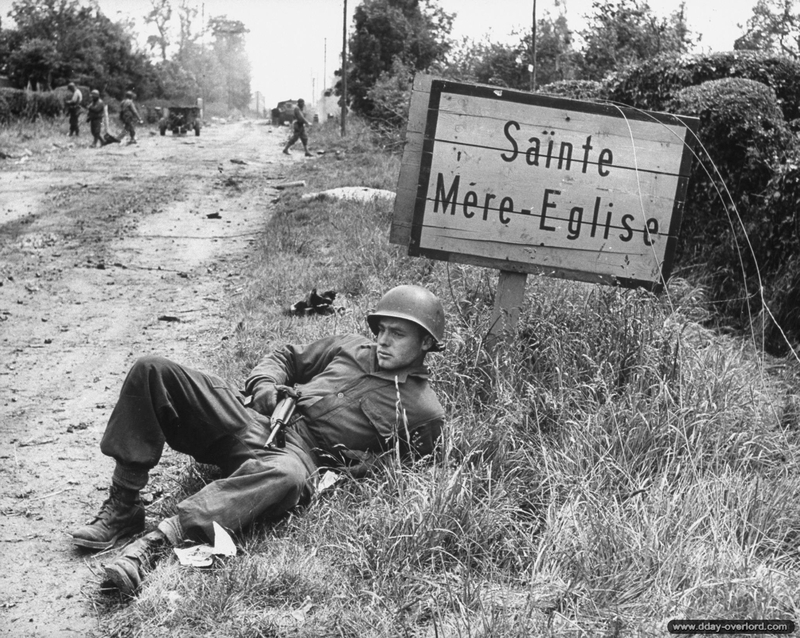 DZ “O” of the 505th Parachute Infantry Regiment (PIR) of the 82nd Airborne was encircled to the north, south and west by a swamp, and to the east by Sainte-Mère-Eglise: many paratroopers landed in the village and became easy targets for German soldiers who were patrolling the town after an incendiary bomb caused a house fire. 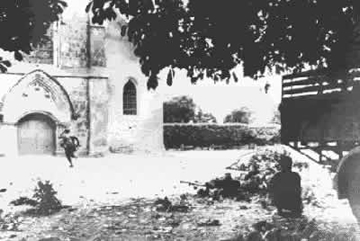 A dozen American paratroopers landed in the church square and were shot down by the German sentries. Paratrooper John Steele remained hung to the church steeple for more than two hours until most of the village was under American control: after short but violent fightings, theAmerican flag was installed at the town hall around 4 am by the men of the 505th PIR : the town of Sainte-Mère-Eglise was finally liberated, but the fighting was not entirely over. 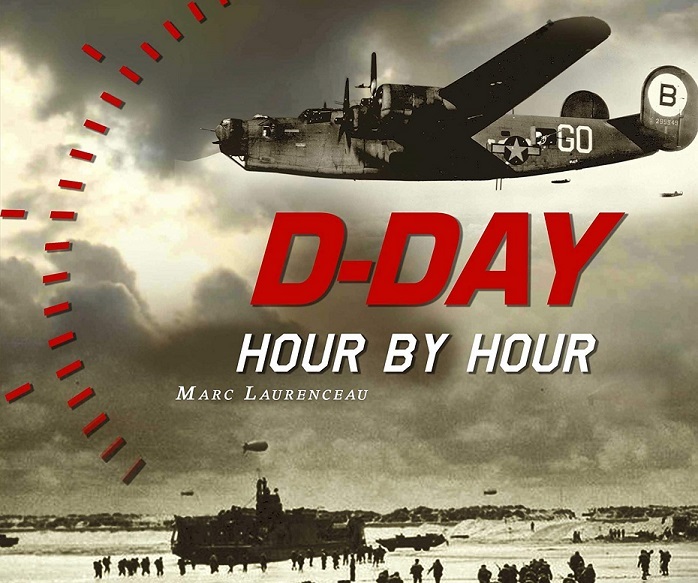 Skirmishes continued throughout the night and in the early morning of D-Day, American paratroopers could hear the detonations of the bombing carried out by the warships of the Allied armada: the landing was about to begin. Causeways 1, 2, 3 and 4 were under control aaround noon. The junction between landed troops and air-transported troops was carried out at about the same time. In order to considerably increase the firepower of the American soldiers in the Cotentin, the Allies launched operations Keokuk and Elmira at 9:00 pm on June 6, 1944, respectively for the benefit of the 101st and 82nd Airborne divisions. 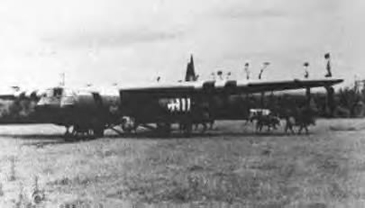 Horsa gliders landed on the LZ “E” (Keokuk) and “W” (Elmira), cleared as much as possible by engineers during the day. They transportedadditional human and material resources, including anti-tank weapons, medical equipment, ammunition and radio stations. 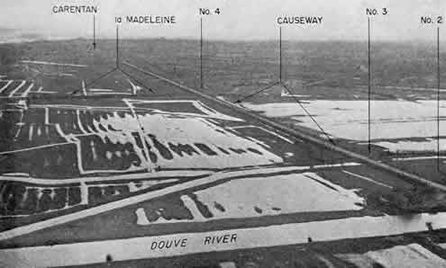 Insulated from the supply routes due to the multiplicity of the drop zones and the different objectives to be attained, the Allies launched new airborne operations on Wednesday, June 7, 1944, starting at six o’clock in the morning (operation Freeport for the 82nd and operation Memphis for the 101st) and two airlanding operations for the 82nd (operations Galveston and Hackensack). 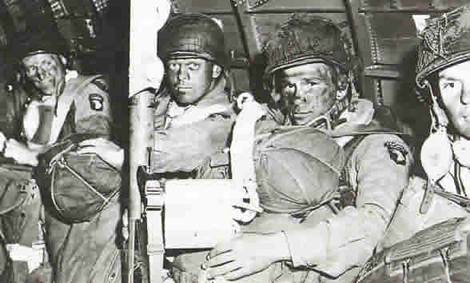 Despite an extremely high number of casualties (more than 50% in the single night of June 5-6, 1944), American paratroopers of the 82nd and 101st Airborne accomplished many of their objectives. 2,500 airborne paratroopers and soldiers were died, injured or missing in action as a result of the airborne assault behind the Atlantic Wall fortress. The Germans, disorganized by the American random drops, no longer knew where to intervene. They were unable to trace the exact outline of the positions and objectives of their opponent. Not mastering this information, they were not able to counter-attack in a coordinated and effective manner. The lack of general officers on D-Day in the Cotentin weighted heavily in the balance, especially as General Falley commanding the 91. Luftlande Infanterie-Division was killed shortly before sunrise by paratroopers of the 508th Parachute Infantry Regiment. Moreover, the sabotage actions carried out by the French resistance accentuated this phenomenon of disorganization which paralyzed German forces in this sector: communications between command posts were limited or even impossible and reports struggled to find the right interlocutor. Disorganized, jostled, the Germans were pinned down throughout the day of June 6 by the airborne units, which allowed the Allied amphibious forces to take foot on the Normandy beaches and to install a solid bridgehead. The courage, sacrifice and tenacity of American paratroopers profoundly marked the history of the Battle of Normandy.